Pedestrian accidents are far too common in our communities. According to a report from the California Department of Public Health (CDPH), approximately 13,500 pedestrians are injured in crashes in the state every year. Most pedestrian collisions could have been prevented with proper care. All California drivers have a legal duty to look out for the health and safety of pedestrians. It is crucial that both pedestrians and motorists understand their responsibilities under California state law. Here, our experienced Monterey pedestrian accident attorneys provide an overview of the most important things that you need to know about the California pedestrian laws. In California, pedestrians have the right-of-way at most intersections. This means that drivers must yield to allow pedestrians to safely cross the street. Notably, under state law (California Vehicle Code § 21950), pedestrians have the right-of-way at intersections regardless of whether or not there is a marked crosswalk. To keep everyone safe, motorists should err on the side of caution and yield to pedestrians. Beyond allowing pedestrians to have the right of way at intersections, California drivers have a general duty to exercise due care and to look out for the safety of pedestrians. Drivers should always keep their full attention on the road at all times. Distracted driving is one of the leading causes of pedestrian accidents. In areas with high levels of foot traffic, careful driving is critically important. The state of California does not put the entire burden of pedestrian safety on the backs of drivers. Quite the contrary, pedestrians also have a duty to exercise appropriate care. The California vehicle code explicitly states that a pedestrian is not relieved of “the duty of using due care for his or her safety.” As an example, if a pedestrian suddenly leaves the curb away from an intersection so as to constitute an immediate hazard, that pedestrian may be responsible for any resulting crash. INJURED FROM A PEDESTRIAN ACCIDENT? Discuss your legal options with our personal injury lawyers during a free consultation. Both drivers and pedestrians need to use their common sense. Pedestrians should always take proper safety precautions to protect their own health and well-being. Never assume that a driver can see you or that a driver will act in a safe manner. In the unfortunate event that you or your loved one is injured in a pedestrian collision, you should consult with an experienced attorney immediately. Were You Injured in a Pedestrian Collision in Santa Cruz or Monterey? At the Allen Law Firm, our top-rated California pedestrian accident lawyers are strong, aggressive advocates for injured victims. 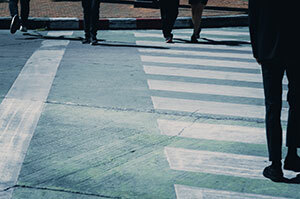 If you or your loved one was injured in a pedestrian collision in California, you need an experienced legal advocate. For a free, fully private initial consultation, please do not hesitate to contact our law firm today. We have offices and Monterey and Santa Cruz and we handle personal injury claims throughout the region.